This article centres upon a species of mollusc that has been imported recently as a “sand-shifter”. Polinices tumidus, the white moon snail is a beautiful animal having a pearlescent white shell almost completely covered in a large expanse of mantle tissue, also white in appearance. Does a beautiful creature like this that also puts itself to good use moving around in the sand and keeping the substrate aerated sound too good to be true? Well, unfortunately it is! Moon snails belong to a family of gastropod molluscs called the Naticidae or moon snails. This group is characterised by possessing large rounded or globose shells and large bodies (the body tissue of molluscs is referred to as the mantle). 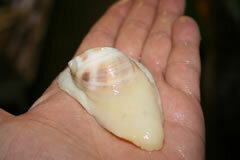 The last whorl of the moon snail’s shell is very large making up around 85% of the entire shell. The entrance to the shell of living specimens is covered by a chitinous operculum (The operculum is the “door” that enables the shell to be sealed thus protecting the snail from predation). When the animal is active the mantle will cover a large percentage of the shell. On the rare occasions that you observe this species above the sand, which is usually when it is in hunting mode, you can observe a thickening of the body tissue at the front of the animal. This acts like the blade of a plough, pushing sand out of the way of the animal. The relatively large food of the snail acts like a snowshoe, spreading its weight and allowing for relatively fast movement across a treacherous substrate. This is also aided by the production of copious amounts of mucus that binds the sand together leaning that the animal is less likely to sink beneath the surface. It is incredible to observe a moon snail unpacking its massive body from inside the relatively small shell but it can do it. It’s like watching a driver’s airbag inflating in slow motion. The snail is unlikely to remain in a closed state for too long as it is known to have extreme difficulty in breathing when packed inside its shell and it is far more reluctant to shut itself away in the first place preferring to wait for extreme emergencies before it takes evasive action. Once the snail is out it can then bury itself in the substrate-the environment of choice for the Naticidae, something that it can achieve in a very short period of time. Even large specimens can be completely concealed beneath the substrate in less than a minute. So the fact that you are not going to see much of this beautiful snail in you aquarium is one good reason not to purchase it. However, take a look at the diet of this species and you will have several more. Moon snails are carnivorous and their range of prey items is such that they will preclude their inclusion in most reef aquaria. The Naticidae are renowned for their predation of bivalve molluscs and to the tropical reef aquarist that means flame scallops and Tridacna or Hippopus clams. Their style of attack depends upon the size and species of prey item involved. Large clams are often literally undermined by the snail: the snail excavates the substrate from beneath the clam causing the bivalve to fall into the void space. It then becomes smothered by sand and suffocates realizing its large adductor muscles that are responsible for keeping the shell closed. The moon snail can then feed at its leisure without once venturing above the surface of the substrate. If the victim is not susceptible to mining then the snail might try using its specialized feeding apparatus, the radula, to bore a hole into the hinge of the clam. This structure is located at the end of a long and flexible proboscis that secretes chemicals to aid in the drilling process. Once the hinge has been broken the snail can gain access to the fleshy interior, which it macerates with the radula and uses digestive secretions to break down before sucking up the contents. Both of these strategies are generally employed in situations where the victim is significantly large than the snail. The drill-hole of a moon snail is quite characteristic being described as “funnel-shaped” by many authors and is wider at the top than the bottom. Smaller prey items are treated differently despite having thinner shells that would be easier to penetrate by drilling. The moon snail will use its large foot to grip and smother its victim. Aquarists without any bivalve molluscs in their aquaria should not necessarily feel confident that their aquarium could be home to a moon snail. Captive specimens have been observed feeding upon Nassarius snails using the foot-hold-and-suffocate technique and it would be prudent not to introduce moon snails to an aquarium containing any species of mollusc including the various herbivorous gastropods collecting known as “turbos”. Many species of moon snail are reported to supplement their shellfish diet with scavenging upon the corpses of fish or invertebrates. In captivity the acceptance of whole dead cockles, mussels or pieces of fish seems to depend upon the individual concerned. If an aquarist envisages a role for this species, for example in an isolated deep sand bed where it will turn over the sand and prevent it from becoming compacted then it would be wise to observe a specimen feeding on dead material before introducing it to the aquarium. As is often the case with species that are largely unsuitable for most marine aquaria the white moon snail has so wonderful characteristics that would immediately endear it to aquarists and not least amongst these is the production of “sand collars”. There will be a small number of aquarists out there that have bought white moon snail for their advertised sand shifting abilities. A number of these individuals will have awoken one morning and gone for their morning aquarium inspection to be greeted by a bizarre structure arising from their sand. This is a sand collar and despite resembling a medieval ruff crafted by a highly skilled artisan from fine grains of sand it is in fact the egg mass of the white moon snail. Even when armed with this knowledge close scrutiny of the structure does not help to explain how the snail is capable of creating such a delicate structure. Each layer is very thin and delicate and yet the entire structure seems to be quite durable; withstanding strong flow and the boisterous behaviour of fish. This is because the entire construction is held together by mucous cement. First of all the snail cements a ribbon of sand together by exuding mucus from the underside of its broad foot. It then deposits a thin layer of eggs on top of this that is sandwiched by another layer of sand and so on. All the time this process is going on the snail moves in a circular manner creating the characteristic multilayered structure. This behavior seems to have been elaborated from the production of egg masses within a gelatinous cocoon made entirely from mucous. Some members of the Family Naticidae still produce these to protect their eggs. Other species in the group produce much simpler sand collars than the white moon snail consisting of a single whorl, sometimes not even creating a complete circle. On average the moon snail will deposit around 100,000 – 500,000 eggs when fully grown. These will stay in the sand collar for approximately 2-6 weeks depending upon thespecies. When the eggs the larvae are planktonic and therefore will not survive for long but may give some corals and other invertebrates a good feeding before they are taken care of by the aquarium filtration. Ironically, the veliger larvae of the moon snail are exactly the type of zooplankton that is filtered out of the water column by bivalve molluscs. At the present time the hobby is only having what might be called a brief flirtation with the moon snails and Polinices tumidus is the only species being imported with any regularity. Some species have been reported as being the size of an apple with an appetite to match. Adult Naticidae have been shown to consume around one bivalve every four days on average which means that most would make short work of an aquarists clam collection in a very short period of time! Moon snails are unlikely to be confused with many other mollusc families but the most similar group are a small group of primitive opistobranchs that have retained their shells and are commonly know as bubble snails. It is thought that they represent a “missing” link between the relatively sophisticated shell-less sea slugs and the shelled mollusc. There are a number of characteristics of each that the aquarist can use to separate these two families. Hydatina albocincta is an opistobranch mollusc that is superficially similar to the moon snail family. The enlarged foot surrounds the central shell. The large foot of the moon snails is mirrored in the Hydatinidae yet in the latter it is far more elaborate having curled edges and seemingly indulgent folds. However, this is designed for creeping along the surface of sandy substrates not for digging. The opistobranch does not need a plough or shovel with which to bury itself. A second distinguishing characteristic is the shell itself. It is difficult to ascertain why Hydatina spp retain the shells as it is of sufficiently insubstantial structure not to deter many predators. It could be that the brightly coloured foot advertises that these molluscs are distasteful or even toxic, a trait they would share with the moon snails that are known to contain amounts of tetrodotoxin (this is the same potentially lethal poison found in some species of pufferfish) but nonetheless it is possible to discern significant differences between the shell of the moon snails and that of the Hydatindidae. Contain Toxic TTX Tetrodotoxin-same toxin found in pufferfish.